Mike Keating's Savannah Cardinals came back in this April 1990 game and they came back convincingly. Helping them do that, according to The Spartanburg Herald-Journal, was Keating. Down 2-0 in the third, it was a Keating single that started the scoring. By the time Savannah was done, they were up 7-2, The Herald-Journal wrote. Keating's chances to participate in comebacks ended up being few. Keating played at three levels for the Cardinals in 1990. It ended up being his only season as a pro. 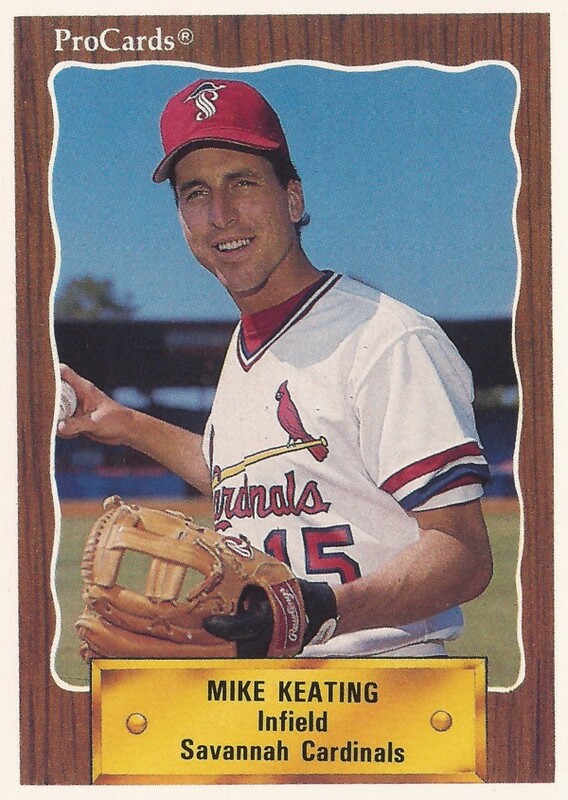 Keating's brief career began that spring in 1990, signed by the Cardinals as an amateur free agent. Keating was born in New Jersey. He started that season at Savannah. He got into 42 games mostly at shortstop. He hit just .125. At the end of April he was among several players fined, but not suspended, for a brawl. Keating later got 10 games at single-A Springfield and 30 in the rookie Arizona League. He hit .136 at Springfield and .180 in rookie ball. It was his only season as a pro.